Will it Take a Stampede for Unions to Take Security Seriously? Winter had been knocking at our door for a while, and is finally here. But it does not have to be synonymous to dull and boring. Winter photography could actually bless your Instagram feed. 1.Bonfire: There is hardly anything as comforting as a bonfire. What’s more? They serve as great pictures, both in the background, or as the star of the frame. 2.Peanuts: While a Starbucks does look good in pictures, we should not forget the snack that has been keeping us warm and occupied for the longest of times. Peanuts deserve to be featured in your pictures. 3.Sun-basking in the terrace: Sardi ki dhoop has had honorary mentions in Bollywood. It would be a shame if we let go of the tradition. 4.Shawl/heavy clothes: It is a fact widely accepted that winter clothes surpass all other attires. Grab a shawl, and wrap it around you, the coziness will be sure to be transferred into the pictures. 5.Chai: Bliss is spelled as chai! And it would be safe to say that your winter photography would be incomplete without a picture of chai, or you holding a cup of chai. The warm tones of the bonfires, coupled with the auburn hue of chai will add a whole new dimension to your photography treasure. Every season deserves to be captured, but winter, ever more so, just because of the sheer amount of beauty it adds to the world. When the nights become shorter, life (and your Instagram) becomes better! Journalism has been called the “first rough draft of history”. D.U.B may be termed as the first rough draft of DU history. Freedom to Express. 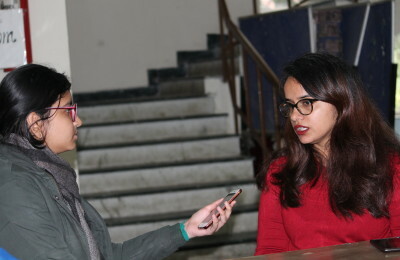 Art and Culture Association(DSEC) to Host Rajnigandha’19! SPADE- The Socio-Economic Society of Shivaji College announces the grand annual ACE! Robotics Club, DDUC Announces Raspberry Pi Workshop! KIET Group of Institutions Presents Prastuti! Entrepreneurship Development Programme Cell of DIAS Brings to You, “LEZARO’19″!